The electrical team has seen tremendous progress in areas of the high voltage system, including battery management system (BMS), the batteries themselves, and the charging mechanism for Renatus. We have successfully connected and programmed the battery management system along with optimizing its capabilities for our own designed battery pack. Wiring instructions for implementing it into the car have been completed, along with verification that all the battery cells are at their optimal storage voltage. The electrical and programming team have also successfully interfaced the BMS with the controller area network bus (CANBUS) network of the central processing unit of the car. With this communication network we are able to collect data from the BMS and have a real time battery monitoring driver interface within the car. More recently the electrical team has looked into many possible charging solutions for the batteries including multiple low voltage chargers, one very high voltage charger, and designing a charger from scratch to interface with the BMS better. On to news about the future car, the electrical team has begun to outline some design considerations they want to include in the car. As well as outlining the design criteria, aka things that the car needs to have in order to be successful. All in all the electrical team is making progress on the vital systems that will enable Renatus to perform exceptionally well. 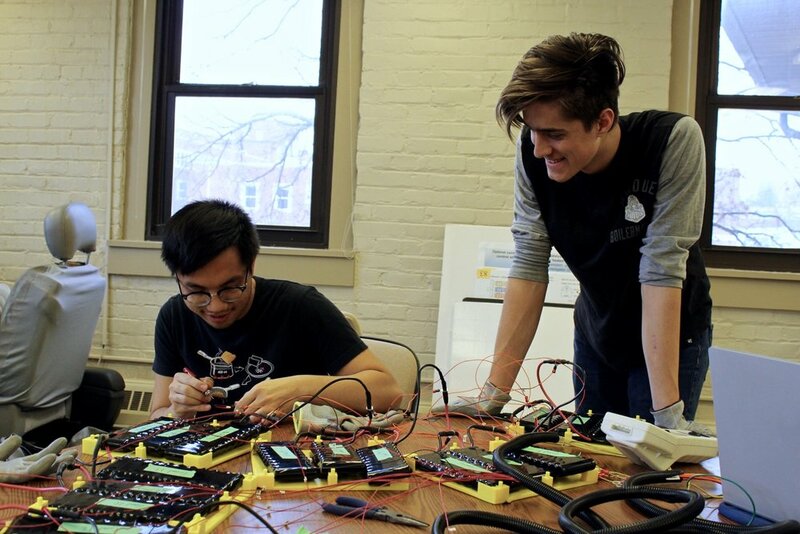 Emilio Sison and Nicholas Gildenhuys testing the battery management system (BMS). In the last few months of the 2018 spring semester, the team continued to work hard on Renatus. The battery storage in the car was designed and constructed. However, there was issues when connecting the batteries together. Once more of the chassis has been completed, the batteries will be installed. We have finished constructing the steering wheel and are currently working on attaching it to the steering system along with cutting and installing the crash foam that was bought this past spring. Most of the lights going on the car have been installed including the headlights, emergency light, and the side indicators. The brake lights are being installed currently. For the braking system, parts have been ordered and we are collaborating with the design team to implement it into the car alongside the suspension to maximize our use of the available space. The suspension system has been manufactured at the Bechtel Innovation Design Center (BIDC) that had opened up within the past year. Many hours have been spent there learning how each of the machines work so that not only will the manufacturing process become more efficient but our more experienced members can teach the new members joining this fall. Most of the suspension has been installed into the car, and the rest will be installed alongside the brakes and shocks. The team is looking forward to this new school year. Stay up to date with us by joining our Facebook Group at Purdue Solar Racing and on Instagram @purduesolar. A lot has been accomplished since February. First off, the electrical team worked on the solar arrays and tabbed many two by 5 arrays together. Two panels were encapsulated in the easy bake oven. One of them melted the bag to the solar array and was ruined. The other one had wrinkled eva probably due to the high vacuum pressure that is encapsulated at. It will still work but it is not the intended product. On the design side, the canopy bubble shield was sent to out to be manufactured in addition the remaining fairing molds, motor housing, and canopy. The suspension design was finished and sent that out as well to be machined. The manufacturing team made the most progress in the past couple of months. We cut out the coring and foam for the lower body mold. After those layups were finished, we then put on the final layer of carbon fiber to the lower body mold. We used an envelope bag for this last layup and unfortunately it ruined the wheel wells of the lower body mold. We remade them and sent them to Bob Rohrman to be painted. We finished painting and sanding the fairing molds and put down 2 layers of carbon fiber for each mold. We also redid the leading edge layup in order to give us more material to work with. The fairings and canopy were all mated together using either kevlar or fiberglass. In addition to the work done on the fairings and lower body, the chassis was also worked on. The pieces for the chassis arrived just before spring break and most of the driver box was finished by the end of spring break. The chassis is now nearly complete and still needs some additional carbon fiber joints to be added for structural integrity. Before the unveling, we had a finished lower and upper body mold. We finished all of our fairing but did not have the method of attaching them finalized. Our canopy does not yet have the bubble shield but that should be coming in within the next few weeks. As a final word, I wanted to thank everyone who has helped over the past few months. The amount of hours that were devoted to this car by this team's members is staggering and yet we still have more to do. Thank you for your continued commitments to the team and I can't wait to see you at the next meeting. The team spent most of this week sanding the lower body mold. We figured out that wet sanding goes by much faster and so the mold is nearly finished and ready to conduct layups on. The design team also has continued to modify the suspension and conduct chassis panel testing. Thanks to everyone who made it out this weekend and sanded the lower body mold. This week marked the first meeting since school started. During the Saturday meeting, we calculated the number of solar panels we could fit on the top of our car as well as cut our high density foam for making the rear fairing molds.